Double Dragon makes a long-awaited return this summer, with all the aesthetic horror of the 1980s in tow. 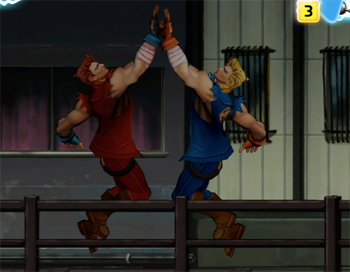 Publisher Majesco unveiled plans this morning to release the aptly named Double Dragon: Neon on the Xbox Live Arcade and PlayStation Network this summer. Why "aptly named?" Because the game marries classic Double Dragon-style fisticuffs with the sights and sounds of the series' original era -- that is to say, the retina-searing neons and "blaring buttrock guitar solos" of the 1980s. Conceptually, that's pretty neat, but the real reason why this news is exciting is that Majesco has tapped Wayforward Technologies to develop the downloadable title. You might remember Wayforward as the developer behind cult classic Game Boy Color title Shantae, the underrated 3DS Shinobi or the straight up pitch-perfect Contra 4. Bottom line: This is a developer that knows how to distill a classic property down to its most entertaining, relevant components, then transform it all into an engaging, modern gameplay experience. Plus, Wayforward tends to jam-pack its games with tons of unlockable extras and hidden fan service. I'm a sucker for that kind of thing. Since Double Dragon: Neon is at least a few months off, we don't really have concrete details on pertinent things like the game's release date or price tag. Presumably that's all info that will appear in the near future, but until then feel free to peruse IGN's preview of the game. It doesn't contain much beyond what I said here, but the info it does offer is often totally baffling. ... Ditto for the music, which included a sizable helping of blaring buttrock guitar solos, synth drums, and all the keyboards you could hope for. Songs can be found or bought to add to your in-game mix tape, and can even be leveled up as you play for even more 80's awesomeness. How does one "level up" a song? Or are we talking about "leveling up" the "in-game mix tape?" Because if so, how does one "level up" a mix tape? Baffling wordplay aside, that IGN piece is where the news of this thing originally broke, so that's everyone's source on this story. Plus, they have a bunch of exclusive screenshots. After you're done giving us all your precious pageviews, go give them some too. That's just smart consumerism.